You guys know I'm all for short shorts. If you have the busting quads then get a pair of Chubbies. They're about to become really popular and some of their styles have already been placed on backorder since their recent launch. 5" inseams are nothing new but it's their designs and the fratty-approved GTH impression that makes these "wear with anything, do anything" shorts appealing. More so for walking down Bourbon St. with the boys or stumbling to the post-game party than for anything else. 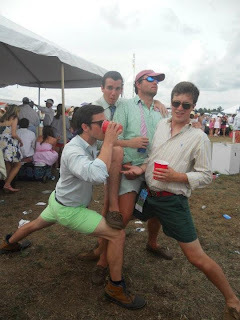 Fratstars rejoice in your pasty legs and "Thighs Out, Brahski!"